Our dreams can be the most uplifting, most fulfilling element inherent in the human design. And they can also be the most destructive. When realized, dreams can fill cavities in the human heart that we never even knew existed and that have no physiological parallels, making us feel whole for the first time in our lives. Or in the disillusion of our dreams, the cavities become like caverns, like sticks of dynamite were stuck in them, and the explosion of negative emotions inflicts permanent, collateral damage on our souls, leaving us with a lost connection to the very thing evolution has instilled in every one of us that pushes us forward in hopes that in the grace of history we can be measured as something more than the sum of our human parts—that our indelible mark will linger, and that somebody beyond our own time will remember that we were here, and that our mark will leave the world one measure better. This drive is what sent our ancestors trekking out across barren middle America, and deposited settlers into the breadbasket to seek their fortunes in the tilled soil of the plains. 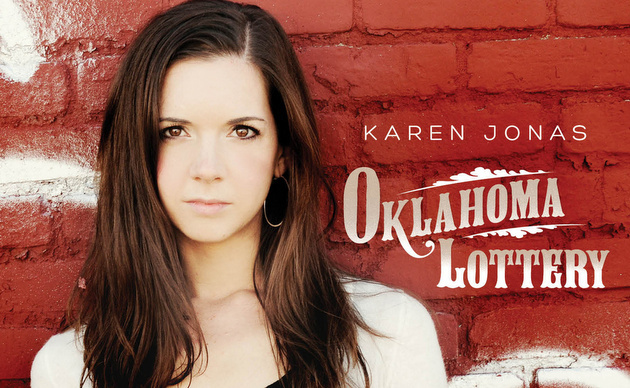 Fredericksburg, Virginia songstress Karen Jonas sings about this in the title track of her new album, Oklahoma Lottery—how some came with heads full of dreams, and when they scratched the surface of their little appointed marks in the American dirt, they came up blank. No cherries aligned, no stars formed a diagonal pattern, no doubler hit, and no consolation prize was awarded. And so they moved on, their backs a little more bowed, their eyes a little more glazed. Karen Jonas, whether she knew it or not, heeded the advice of the great Ray Wylie Hubbard to all songwriters: don’t just listen to The Ghost of Tom Joad, read The Grapes of Wrath. How do we know this? It’s not just from the wisdom interwoven in the lyrics, it’s from the amount of pain Ms. Jonas is able to capture in her performance. This isn’t just an inflected interpretation, but the very evocation through herself of the troubled ghosts of the story —not just wrapping herself in their clothes, but walking a mile in their shoes, and then conveying the pain she knows they felt from the aching of her own blisters. 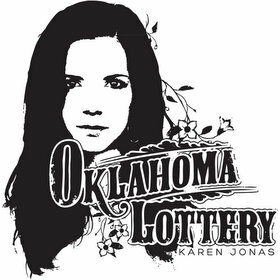 If music was a lottery, then Karen Jonas hit big. But this is no fortune to be chocked up to sheer luck. The toil, the heart that Karen Jonas put into this music and this record is eminently palpable. And it is not just the result of talent, but talent honed and refined through cutting self-criticism, study, discipline, and work. This music starts with a girl, her guitar, her stories, and her demons. Similar to Justin Townes Earle in the way she plays the guitar in a hybrid of the clawhammer banjo style—a plucking with her thumb and then striking the strings with the nail side of her fingers—shows a refined study of her instrument, not just a rudimentary running through of chords while letting the words tell her story, with no sense of style to match up with the mood. This musical approach exacerbates the lead-heavy, almost unbearable tension that Karen is able to instill in her music. Her music aches like a broken heart; heaves and creaks like the boards of an old wooden floor under heavy weight. Karen Jonas tells stories, like in the aforementioned “Oklahoma Lottery”, and the first track of the album “Suicide Sal” which refers to the Bonnie & Clyde saga. And then she gets quite personal, alluding through numerous offerings about her tragic, recurring frailty when it comes to matters of the heart, and men. You get the sense with Karen Jonas that there’s a deeper narrative here; a tragic story underlying all the little glimpses she gives us, but a story she never completely reveals, which once again goes into building the tension that elevates her music above the din of musical noise. Karen didn’t just make this record to entertain us, or even to convey some expression or message. She made it to prove something, to herself and to others, that her choices, though not always right, were hers, and she was willing to take ownership of them, and redeem herself through music. Karen Jonas is hungry. She is eager to fill the holes that still remain in her heart. This is reflected in this album, and she’s done all she could. The seeds are planted in fertile ground. The next question is, should anyone pay attention beyond her little groove in Fredericksburg, Virginia? My answer would be that they most certainly should. Excellent write up. I’m looking forward to giving this one a good listen. Country women aren’t just comin’ out with guns blazing, they’re carrying an arsenal stocked full with grenades and rocket launchers! Haven’t heard the song yet, and I will post a response when I have time to listen. Any relation to the Jonas brothers? Very, very nice. Her voice reminds me a just a ittle of Amanda Shires. I can see fans of Amanda (like me) enjoying this. I live about about 40 miles north of Fredericksburg and I see she plays there a lot. Saw that she played about 5 miles from my house last month. I think I see a live show and a CD purchase in my future. Thanks for writing about her, Trig. Had not heard about here before, but I’m impressed. Very nice. I like her voice. I see a vinyl purchase this weekend. She’s also a terrific live performer, well worth seeing. Her sets incorporate both her original songs and fine covers which range from Hank Williams to Johnny Cash to Gillian Welch. Simply beautiful. Exquisite voice and deep songwriting. “Thinkin of You Again” is my favorite song on this album. I also love “Steppin on Your Toes”. “The River Song” could be even further improved by adding some steel guitar during the instrumental phases, but nonetheless it is still a fantastic song with profound lyrics. Just wow. Excellent review and as always Trigger this is why I enjoy the site so much as I never would have heard of Ms Jonas without visiting SCM. Here we are already in April and this is the first album I’ve listened I expect will be a serious contender for Album of the Year. Just when bro-country gets you down you get something like this. Whenever I see you review an album, I don’t even check out web links or anything like that for a preview.. I just go straight to the artist’s site or Amazon and buy it. You are yet to steer me wrong, Trigger. This is really good… thanks for the review! I live just south of Fredericksburg on the Northern Neck, definitely gonna be heading up Rt. 3 sometime soon to check out one of her shows, ha. Ironic, I’d hear about great talent in my own neck of the woods by way of Austin, Texas. I guess I need to get out more! To find stuff like this is the reason I frequent this site. Probably would have never heard of Karen Jonas otherwise. I don’t give this the glowing review that the author (or the recent replies) have. But that’s just personal taste. Love her voice. But the songs are hit and miss for me. Some I like, some not so much. But I’m not here to save country music, I’m here to find music I like. Her voice is soulful, her writing is evocative, haunting, and lyrical. I heard her perform recently and have had her CD on repeat.